(Coriolus versicolor - 1) Coriolus versicolor are generally found on rotting trees, both standing and fallen. 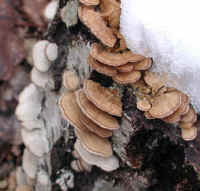 In this photo the Coriolus versicolor is growing on a standing dead white pine tree. These fungi are inedible because of their tough corky texture. 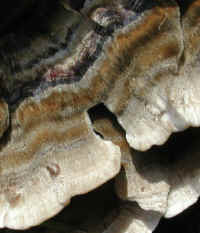 The Coriolus versicolor is easily identified by its color bands. (Coriolus versicolor - 2) In this close-up view of the damaged edge of a Coriolus versicolor we can see the tough inside. 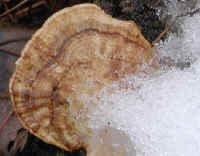 The glistening substance on the surface of the upper Coriolus versicolor appears to be pine gum. 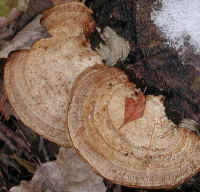 (Coriolus versicolor - 3) In this photo of the Coriolus versicolor, the upper fungus has been acting as a protective covering for the lower one by absorbing the impact of most of the weathering and falling debris. (Coriolus versicolor - 3a) Coriolus versicolor usually grow individually, and often are stacked one upon another, as these are. Sometimes, they grow side by side and, as they mature, they partially fuse together, as shown in this photo. (Coriolus versicolor - 3b) This close-up view of the Coriolus versicolor shows a detail of the color bands. We have found that the colors of this species seem to vary, which we believe is caused by the minerals or other substances in the various trees upon which it grows. 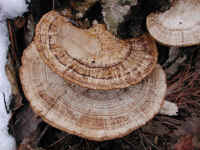 (Coriolus versicolor - 04) We spotted these Coriolus versicolor mushrooms growing on a cut tree stump. They seem to be growing in circles to match the rings on the stump. 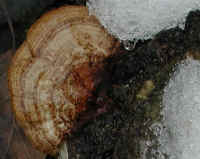 (Coriolus versicolor - 05) This is a closer view of some of the Coriolus versicolor mushrooms growing on the tree stump. (Coriolus versicolor - 06) We found several points of interest in this close-up view of the Coriolus versicolor mushrooms growing on the stump's side. 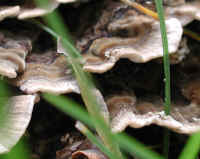 In the lower right of the photo, a blade of grass has pushed its way up through one of the mushrooms. 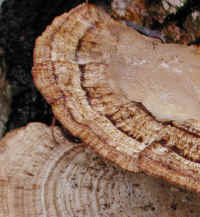 In the lower left we can see that the fungus plates not only have colored bands but they are also ribbed toward the outer edge. 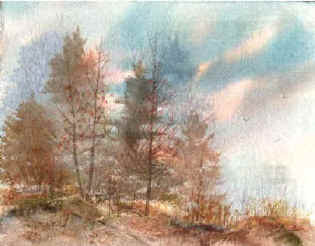 This side view also reveals the difference in textures of the surface color bands. (Coriolus versicolor - 07) When we allow ourselves to observe the details of each aspect of God's creation, we come to realize that there is a whole lot more to it than just fungus growing on a rotting tree stump; everything seems to have some additional beauty when we take the time to look for it. 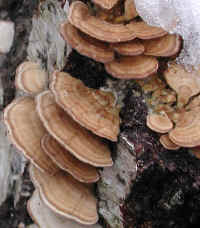 (Coriolus versicolor - 08) We are used to seeing the Coriolus versicolor growing on the side of a dead tree, and in those cases, we miss the interesting patterns they create when growing on the top surface, and how tightly they are grouped together. (Coriolus versicolor - 09) On Wednesday before Thanksgiving, we had a couple of inches of snow. 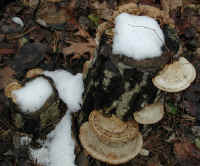 Two days later most of the snow had melted, giving us an interesting contrast for photographing these Coriolus versicolor mushrooms. 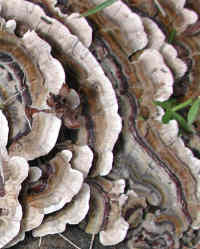 (Coriolus versicolor - 10) This is a closer look at the Coriolus versicolor mushrooms that were growing on the side of a tree stump. We can see that most of the dramatic colors have faded. Also of interest to us was the way the melting snow had formed ice granules. (Coriolus versicolor - 11) There were many more Coriolus versicolor mushrooms growing on the twin stumps of dead birch trees. The way God created this world, the physical remains of death support life. The trees die; the fungus grows. 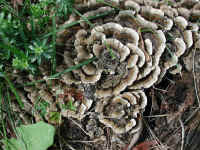 When the fungi are no more, and all return to the soil, they are absorbed into new life. (Coriolus versicolor - 12) Even the faded winter colors of the Coriolus versicolor present us with the beauty of earth-tone "rainbows". They are just another reason to be thankful. 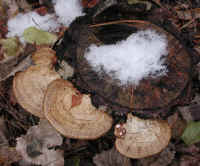 (Coriolus versicolor - 14) This is another Coriolus versicolor earth-tone rainbow in the melting late November snow. (Coriolus versicolor - 15) Each Coriolus versicolor presented us with another point of interest to enjoy, to digitally record, and to share with others to the glory of God. For, until we learn to cherish every aspect of God's creation, we will never know peace on earth. (Coriolus versicolor - 16) These clusters of Coriolus versicolor mushrooms were growing on the northeast side of this stump. We're not sure why the lower ones are almost white. 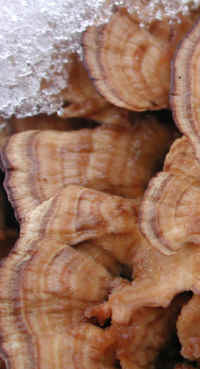 (Coriolus versicolor - 17) This is a closer look at some of the earth-tone colored Coriolus versicolor mushroom clusters. (Coriolus versicolor - 18) This is another cluster of small Coriolus versicolor mushrooms that were growing on the side of this birch stump. (Coriolus versicolor - 19) In the last of this series of late November photos, we were able to capture a little of the brighter color of these Coriolus versicolor mushrooms. � 2001-2002 - The Mary T. and Frank L. Hoffman Family Foundation. All rights reserved. May be copied only for personal use or by not for profit organizations to promote compassionate and responsible living. All copied and reprinted material must contain proper credits and web site link www.all-creatures.org .